Check out these 21 hilarious quick quotes that might describe your mother in law which one comes to mind when you think of your own? 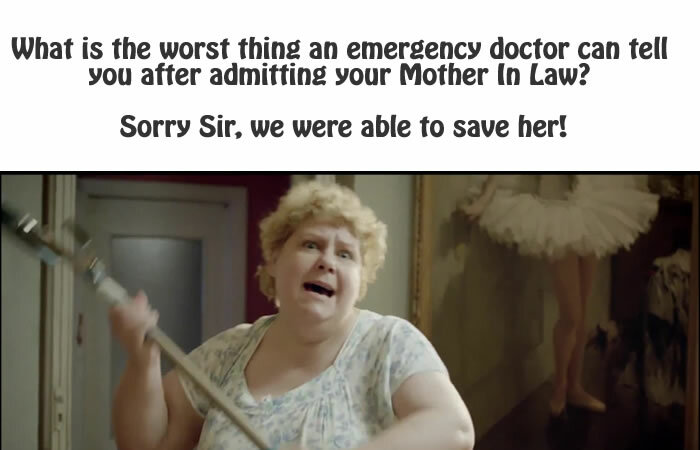 Here are some true Mother In Law stories… god bless them! At our wedding, my mother-in-law asked me (the bride), and her other daughter-in-law and son-in-law to step out of the pictures so the photographer (who we were paying for) could take some pictures of “her family”. So, there I was, the bride, standing on the side, watching her set up pictures of “her family”. Her son-in-law told me to get used to it, as she does this at all occasions (I still can’t get used to it!). After over 18 years, 3 children, and the usual problems in a marriage, my husband and I have survived. Now, my mother-in-law told me straight out that he should kick me out on the street. She is very blunt about this to my children as well. My youngest comes back to me and asks why “gramma wants daddy to kick you out.” My husband is spineless when it comes to her. There are also 5 sisters that support my mother-in-law in her decisions. I have told her to stay out of our lives, but I was never rude, just firm. I have even brought the children up to see her, but they are getting to the point they don’t want anything to do with her either. I will not make them visit her. To top it off, I am disabled and cannot do anything to please her. She thinks I am “faking it”, and does not understand why I do not work.